One of the joys of farming for me is searching out better ideas. This is especially true for the winter production of cold-hardy crops in unheated greenhouses, a production system that we have been exploring for 35 years or so. 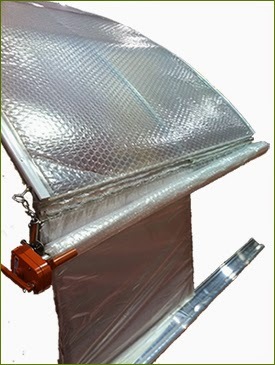 We are always looking for new ways to keep the greenhouses warmer at night without spending money on heat. We will be trialing two promising products this winter. The first is SolaWrap, a greenhouse plastic that looks like bubble wrap, which has been in use for 30 years in Europe but has only just this year been released to the US market. We are most interested in its superior insulating quality, compared to sheet plastic, in order to keep heat in the greenhouse. It is ⅓-inch thick and has an R-value of 1.72, which is superior to the expensive triple–wall polycarbonate. We also appreciate that the material comes with a 10-year guaranteed lifespan. But probably the most unique property of SolaWrap is the way it is put on the greenhouse. With sheet plastic, the growers and their crew will work frantically to cover the house with one huge piece. I say “frantically” because the process becomes extremely difficult if there is any wind at all. SolaWrap, on the other hand, is modular. It is independently attached between each pair of ribs. SolaWrap is available in 4’, 5’, and 6’ widths, which you choose depending upon the rib spacing of your greenhouse. A cable is welded into each edge of the SolaWrap width. A hard plastic strip, with a slot along each side, is first tech-screwed onto the top of all the ribs. To start installing, the cables are inserted into the slots and the SolaWrap is pulled up and over the greenhouse, one pair of ribs at a time. The slots hold the cables so securely that people can stand on the plastic. Our second trial this winter also involves an effort to store more of the sun’s daily heat in the greenhouse to keep it warmer at night. We will be using 12”-diameter, water-filled black plastic tubes as our heat storage medium. 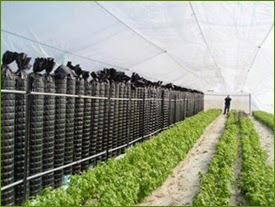 European greenhouse growers have employed this concept for many years by laying the tubes on the soil between the rows of crops, down the length of the greenhouse. That has been beneficial for two crops they commonly grow, tomatoes and cucumbers (two crops not on our unheated winter list); but using them that way would be impractical for our closely spaced spinach and salad crops. However, the Israeli company Ginegar has developed a water tube designed to be held vertically in a simple wire mesh support. With the vertical configuration, a whole row of them, side-by-side, can stand out of the way against the north wall of the greenhouse. In a 50’ house that is about 2000 gallons of water. Will the water-filled tubes freeze solid in the depths of our Maine winter? Would that be a disaster or just a temporary situation? Will we miss the ambient light that used to come from the north side of the greenhouse? Well, that is part of the adventure of exploring new ideas — you never know how things are going to turn out until you try. I am entering my third winter with my greenhouse covered with Solawrap. It still looks like it did the day I installed it! Solawrap is great! I have two SolaWrap greenhouses. They both have exceeded my expectations! My flowers and veggies grow larger and are more plentiful than I have ever experienced before. 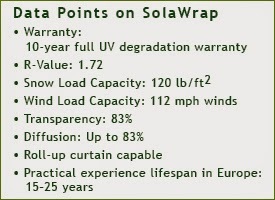 SolaWrap is by far the best greenhouse cover on the market today! I'm a backyard gardener, and I was able to get Solawrap to cover my greenhouse. I love how if the sun is out, the greenhouse is warm, even when it's below freezing outside. My kale has grown exceptionally well all through the heat of the summer and the cold of the winter under Solawrap. I grow tomatoes for 6-7 months instead of 4 (normal outdoor season). I've never lost a panel. I used to us 6 mil poly but our storms would beat them up pretty bad! Love this stuff. Wish they could keep it in stock.